First Line: I remember Anna clearly. American ex-pat Jillian White has it all: a titled English husband and a comfortable life in the wealthy village of Weycombe. When a local estate agent (and friend) is murdered, Jillian becomes worried about there being a killer on the loose, and she begins conducting her own investigation. As she goes from neighbor to neighbor, asking her nosy questions and observing everything she possibly can, she notices how many different versions of the truth she's getting...and her suspicions grow. 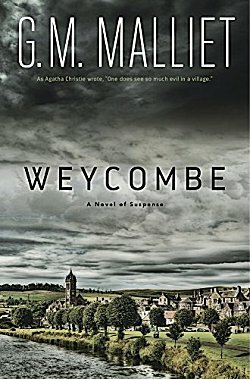 The first thing I should probably say about Weycombe is this: if you've read other books by G.M. Malliet (as I have), do not read this one expecting more of the same. This is not a cozy mystery. It's a diabolical little treat told in the first person by the very snarky Jillian White. Jillian is highly intelligent, highly observant, and always very aware of her status as an outsider. UK readers will be able to see how Americans view their country, and American readers will be able to benefit from her descriptions of life in the UK. Although Jillian and I have the same opinion about a few things (some facts about life in the UK and housecleaning come to mind), I'm not sure we'd be best buddies even if my occasional snarky periods coincided with hers. But being friends with the main character really isn't the point of the book. Jillian's voice kept me under her spell throughout the book. Malliet has written a masterful character study. I can't pinpoint exactly when I began to get my first glimmerings of what might actually be going on in Weycombe, but I know it made me smile. What if.....? No, I am not going to tell you any more. I can't talk about the plot without giving important points away. All I can say is that I thoroughly enjoyed this book, and if you're the type of reader who doesn't mind a rather acid character or when an author wants to try something different, chances are you might enjoy it every bit as much as I did. I hope you do! I always think it's interesting when an author branches out and tries a different sort of story. And this one does sound like a good 'un, Cathy. Glad you enjoyed it. To channel Sally Field-- I liked it, I really liked it! Now your review has me stymied. What is it that's unusual? I am almost tempted to read it -- but do I need to borrow the neighbor's dog and keep the lights on? I don't want to say what's unusual about the story. Everyone should come to this one with an untainted mind. And no-- no dog or extra lighting required.